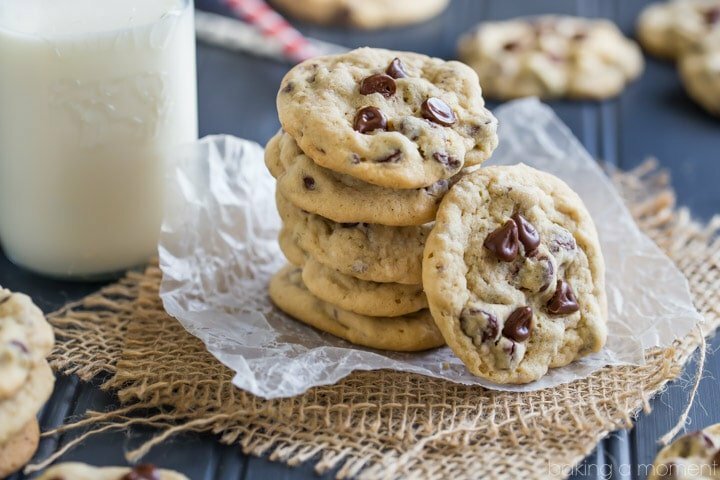 Nothing’s more comforting than a plate of warm, soft chocolate chip cookies and a tall glass of milk. This easy recipe (with no chilling required!) is sure to become a family favorite! The first week of school is drawing to a close! I have to say I think it was a roaring success. I managed to get all the backpacks, school supplies, and new sneakers in plenty of time. And on day one, the kiddos were welcomed home with a big plate of warm, soft chocolate chip cookies. They’re now in the fourth and second grades, so I’ve had a good amount of time to get the hang of this. Believe me, it wasn’t always this way. Just like anything else, being a mom (and mastering back-to-school prep) has got a steep learning curve. And the hardest thing is, just when you feel like you’re finally getting good at it, something changes in a major way and there you are at square one again. So I guess I’m probably in for something real soon. I’m bracing myself! But for now, let’s talk cookies! For the longest time, I have felt like I didn’t have enough cookie recipes on this site. So this year, I’m trying my best to rectify that. I’ve been busy developing recipes for the kinds of cookies we find ourselves wanting to make again and again. Now you can find sugar cookies, peanut butter cookies, linzer cookies, gingerbread cutouts, vanilla cutouts, chocolate cutouts, soft ginger cookies… whew! And lots of others too! But the number one, the most iconic and beloved, has to be soft chocolate chip cookies. It’s definitely the one we crave the most at my house! My kids ask for them all the time. That’s why I figured this would be the perfect time to share my best recipe. I can’t imagine a more perfect way to celebrate the new school year! I think you will love this recipe- the cookies are so soft they practically melt in your mouth. The brown sugar brings the most home-y flavor, and they’re so butter-y, with just a hint of salt for balance. Plus they’re loaded with chocolate! Just the way a chocolate chip cookie should be. And, they come together in a snap. I’ve tried a lot of soft chocolate chip cookie recipes over the years, and some of them have the most annoying habit of making you chill the dough for hours on end. I don’t know about you, but when I get a cookie craving, I need to satisfy it stat! Ain’t nobody got time for that. And why should you have to? I’m sorry but if a dough is too soft to be scooped and baked right away, then there’s something wrong with the recipe! Plenty of brown sugar: You need some granulated too, to help the cookies to set properly, but brown sugar has a higher moisture content so it will help keep your cookies softer. An extra egg yolk: Egg yolks are mostly fat so they really help to enrich the cookies, but they offer a little more “binding power” than just butter, so the cookies won’t spread too thin. We want cookies, not pancakes! Cornstarch: It’s a magic ingredient; I put it in all my cookie recipes. I’ve been doing it for years, ever since I came up with my cutout cookie recipe. Up until that point, I had been using just flour and my cookies always came out a little tough. Then, I stumbled upon a recipe for Meltaway Cookies. It used cornstarch for a melt-in-your-mouth texture, and I thought, that’s just what I need! I’ve been adding cornstarch ever since. Besides yielding a softer, more tender cookie, it also makes the dough a dream to work with. A higher baking temperature: This way, the cookies puff, spread, and quickly set around the edges and on the bottom, while maintaining a soft and gooey interior. Be careful not to overbake them! You’ll want to pull them from the oven when they’re just barely beginning to turn golden around the edges, or even a little bit before. Carry-over cooking is a real thing, and it applies to baking too! So now you know all my soft chocolate chip cookie secrets! I hope you’ll give this recipe a try, and when you do, I bet you’ll love them as much as we do! Once they’ve cooled completely, just transfer them to an airtight container and they’ll stay soft and luscious for days- if they can last that long! Make sure the butter is softened. It should be room temperature, not cold. Really whip the butter and sugar together until very pale and fluffy. It should look almost white. This takes between 3 and 5 minutes. Don’t overwork the dough. Just mix in the dry ingredients until combined, and then turn the mixer off. Overmixing will develop glutens that may prevent the cookies from spreading properly. Scoop the balls of dough to 1 1/2 tablespoons. If they are larger than that, they may spread too much. If they are smaller, they may not spread at all. PS- If you prefer a thin, crispy chocolate chip cookie (like Tate’s), check out this recipe! And be sure to follow my *Cookie Recipes Galore* Pinterest Board for all the best cookie recipes from around the web! 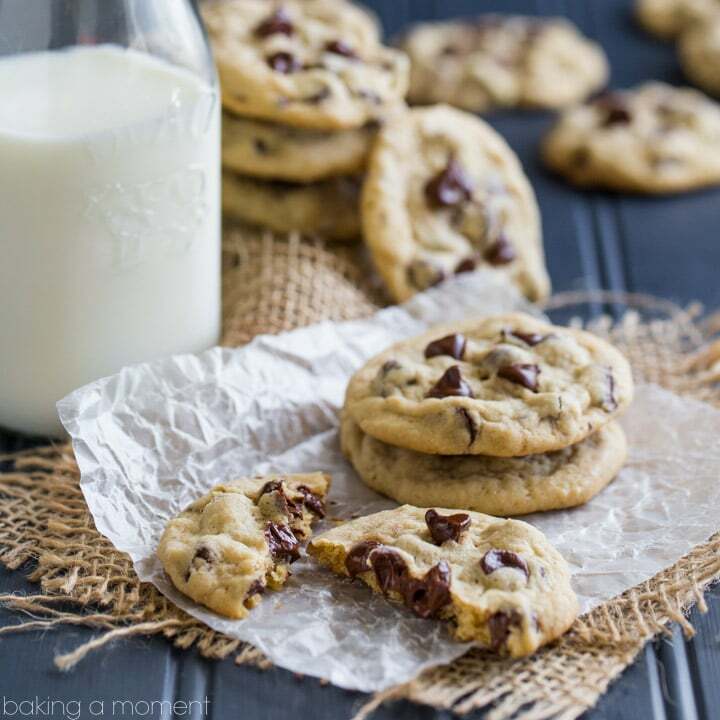 Nothing's more comforting than a plate of warm, soft chocolate chip cookies and a tall glass of milk. This easy recipe (with no chilling required!) is sure to become a family favorite! Preheat the oven to 375 degrees F and line baking sheets with parchment. Place the butter, brown sugar and granulated sugar in a large mixing bowl and beat on medium-high speed until very pale and fluffy (3 to 5 minutes). Add the egg, egg yolk, and vanilla, beating until completely incorporated. Scrape the bottom and sides of the bowl with a silicone spatula, then add the flour, cornstarch, baking soda, and salt, stirring on medium-low speed just until all the ingredients are combined (do not over-mix). Use a 1 1/2-tablespoon cookie scoop to drop balls of cookie dough onto the prepared sheets, allowing about two inches in between (for spreading). Bake (one sheet at a time) on the center rack of the oven for 7 to 10 minutes, or until set around the edges and just barely beginning to turn golden. Cool completely on the baking sheet, then transfer to an air-tight container for storage. i can think of no better way to welcome the kids home from their first week than with this fantastic plate of cookies. sometimes a classic chocolate chip cookie is all you need. love the tips for a soft batch. Such a classic- yours look INCREDIBLE. Hooray! So happy you like them Medha! That’s so great! Thank you so much Beverley! My daughter is in kindergarten now and it is tough trying to find that routine, for sure. I know my daughter would think I am the best mom ever if she came home to a batch of these incredible cookies! I’ve been loving your cookie recipes and can’t wait to see more! Aw I hope you guys are doing well with kindergarten! It’s such a big step and I know you were nervous about it. Thank you so much for the sweet compliments and I will keep the cookie recipes coming! My daughter, who is in 1st grade, asked me if she could bake chocolate chip cookies this week. I found your recipe and it looks so good so we will be baking this tonight 🙂 I’ll update with the results later! Aw, I love that! I bake these with my second grader a lot- it’s such a sweet way to bond. I hope you two enjoy! Hey Sarah! I’m really sorry you didn’t get the result you were after. Just to clarify- they’re not really meant to be chewy. I would characterize them more as a soft cookie. I’m not sure why they would puff up without deflating back down as they cool (that’s how it usually goes for me when I bake them), but I’m thinking it might be because they baked a little longer than they should have. This could be caused by a slight difference in the way our ovens work. If you give it another go, maybe bake them a minute or two less, or scoop them a little bigger. The scoop I use measures 1.5 tablespoons. Try to take them out of the oven right when they’re just barely beginning to turn golden around the bottom edge. Hope that helps! Yess I can totally get behind posting more cookies!!! And these are a total classic-absolutely perfect! Thanks Kayle! Yes I have been loving all the cookie recipes lately, and I’ve still got lots more to come! I used this recipe for a new years party with my friends and everyone (including me) love the recipe! What role does the cornstarch do for the cookies? I’m so happy you and your friends like it! I use cornstarch for a melt-in-your-mouth texture. It yields a softer, more tender cookie, and also makes the dough easier to work with. Hope that’s helpful! Thanks for the great feedback Nakato! So glad to hear it Betti! Cornstarch is my secret weapon in cookie baking. It makes them so tender! Thanks so much for the positive feedback! These cookies are AMAZING!! 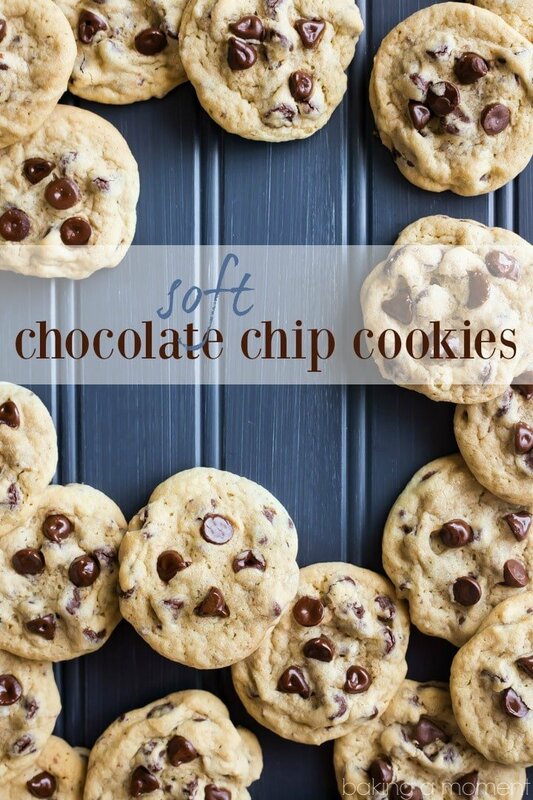 They are my favorite chocolate chip cookie, they are super soft and delicious! I found your website this past Christmas and tried your chocolate cookies which as soon as I baked, my children ate, I was barely able to give any away! I’m so happy I found your website, your an amazing baker, and thank you for your recipes!! I know that anytime I make one of your recipes it hits the spot and is so satisfying!! Thank you so much Diana! I’m so happy you’ve been pleased with the recipes. And thanks for the sweet compliments and encouragement! It means so much to me! I am so happy I found this delicious recipe. This is now going to be my go to chocolate chip cookie recipe. I made these today with my kids and they are so soft even after becoming completely cooled and packed away. total Win for me and my family. Thank you. I’m so happy too! I hope you and your family enjoy the homemade cookies. Thanks so much for the positive feedback! An absolute classic taste that I love so much! I had never thought to use cornstarch in a chocolate chip cookie! Brilliant! I must try these. Those are the dreamiest looking chocolate chip cookies! I’ve never used cornstarch before in cookies, but am so curious to give it a shot. Hi, I only have salted butter. Will that work as well? How much kosher Salt should I cut down? Hey Luna! I’m really not sure how much salt is in 1 1/2 sticks of the brand of butter you are using. But I did a quick google search (“how much salt is in a stick of butter”), and here’s what I came up with: https://www.google.com/search?q=how+much+salt+is+in+a+stick+of+butter&rlz=1C1CHWA_enUS645US645&oq=how+much+salt+is+in+a+stick+of+butter&aqs=chrome..69i57j0l5.15154j0j7&sourceid=chrome&ie=UTF-8. Hopefully this is helpful to you! These are perfect any day or season of the year! 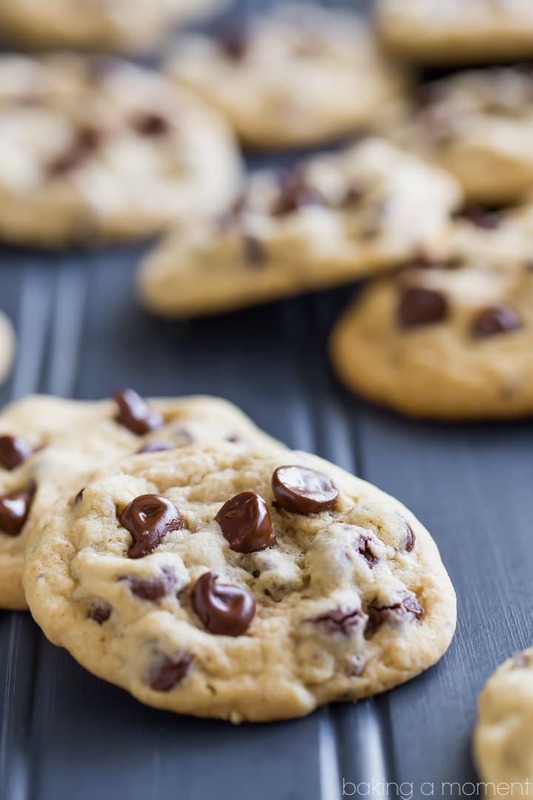 We love your chocolate chip cookies at our house and all your recipes! Well how amazing are these??? Hi! Is the Baking soda the same as Baking powder? No, sorry! Baking soda and baking powder are two different things. OMG. These were the BEST cookies! I made them for a friend when her sister passed for the repast. Days later, I was *still* getting compliments on these cookies! People were angry ‘when the kids took them’. The adults wanted them! And at first people thought they were store bought cuz they were so perfect but the taste changed their mind and they knew they were homemade. Can’t beat the taste of homemade. I *thought* I had all the ingredients and it turned out I didn’t have a bag of chocolate chips but only a bag of Peanut Butter and Chocolate chips. It was a great cookie: Perfect texture and taste! Ooh, I love the sound of those peanut butter chocolate chips Donna! Thank you so much for the awesome feedback! And I’m so sorry to hear about your friends sister. Thank you and I’ll be trying more of your recipes this Christmas season! So glad to hear that Donna! Hi Linda! I’m afraid I have not tried that, so I can’t say for sure. So sorry! I really liked the texture of these cookies and I’m sure it’s the corn starch. If you add corn starch to other cookie recipes, do you reduce the amount of flour? Is it a one to one swap? Thanks. You would have to experiment because it’s not quite the same for all cookie recipes. Good news is all the cookies on this site have already been tested and perfected and they almost all contain cornstarch. You can find what you’re looking for by typing it into the search window at the top of the site. Do you have the weights for this recipe? For instance, lightly packed brown sugar – packed is usually 213g per cup. That would be 159.75g for 3/4 cup, depending on how you pack it. Just curious. 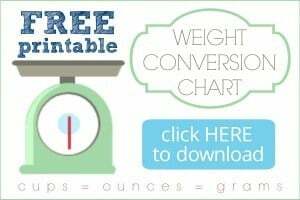 Yes- just click the “metric” button just below the list of ingredients.